Neutral detection poses a significant technical challenge, one which is further compounded when we use neutral helium - the very properties which make it an ideal probe result in it being the most difficult neutral species to deal with. In general, to detect the neutral atom you must first ionise it, but a typical commercially available detector will only ionise one in every million helium atoms that pass through it. Detection efficiencies so low mean that the SHeM would struggle to collect enough signal to build a decent image. My research centers around developing better ways to ionise the helium, and improving the SHeM geometry to maximise the number of helium atoms capable of being detected. One of the new approaches to neutral detection is field ionisation (FI). By supplying a large positive voltage to a very sharp tip, a sufficiently large electric field can be established to cause electrons to quantum mechanically tunnel. Any atom within a certain critical radius of the tip will have an electron tunnel out and into the tip, leaving behind a positive ion which may then be easily manipulated and detected. The main limiting factor to field ionisation is the size of the ionisation volume - for a single tip, it is so small that we still only ionise a small portion of the beam. By moving to an array of such tips (each with its own ionisation volume) we can negate this limitation. I look at ways of tailoring carbon nanotubes and other nanoscale arrays for field ionisation, as well how to integrate such arrays into the SHeM. Caption: Two ionising elements capable of causing field ionisation – an electrochemically etched tungsten tip with an end radius of tens of nanometres, and an array of carbon nanotubes grown via plasma enhanced chemical vapour deposition. 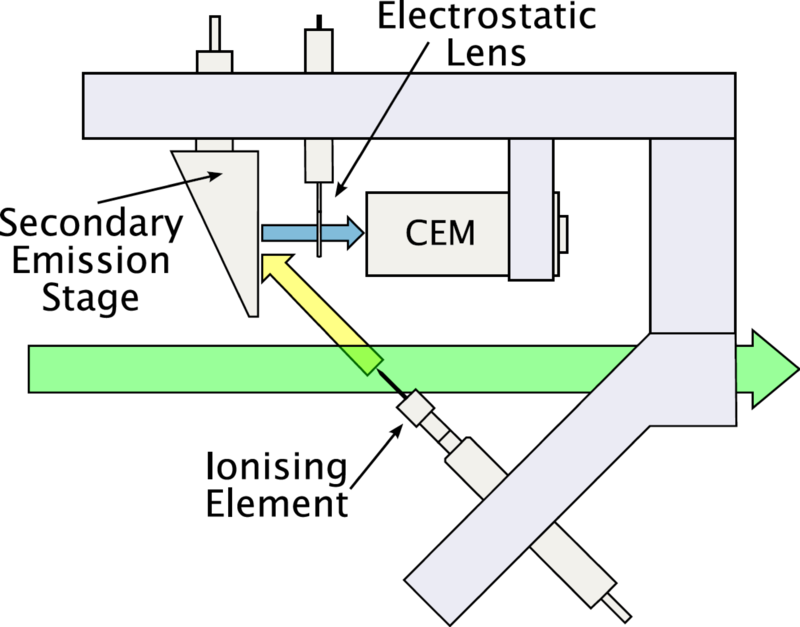 Caption: A detection armature designed to allow prototype nanoscale arrays to be tested as field ionisers, while protecting the delicate channel electron multiplier (CEM) from harm.